Golden Week is a remorseless monster that swallows up everything in its path. Continuing on from last chapter, Senbonzakura pummels Gerard's head. When it clears, everything above his shoulders is gone. The rest of his frozen body then cracks and crumbles to the ground, leaving only his legs in in solid pieces. Hitsugaya stumbles out of the mess and begins to collapse, but Byakuya catches him and props him up. 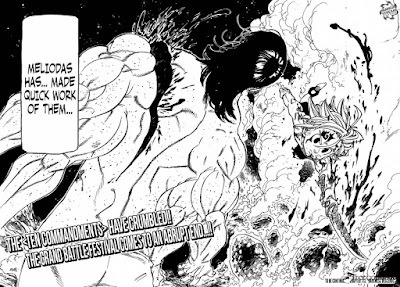 They banter a little about Hitsugaya's remaining strength, but are interrupted by Gerard regenerating yet again, this time into one of the Horrors of Party Beach. Left: Heart of the Soul King and mightiest of Quincy. Right: A goofy-looking B-movie monster. 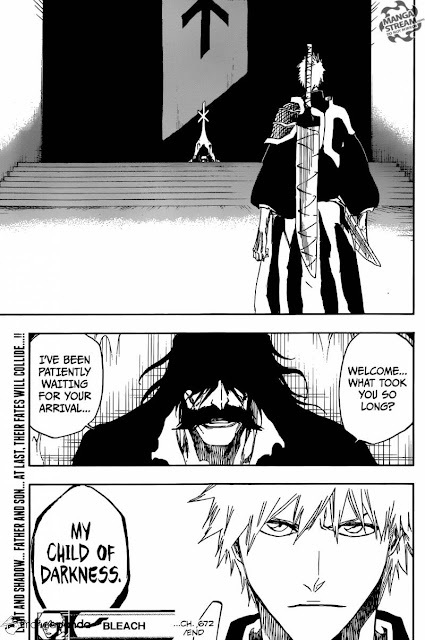 Meanwhile, above, in the throne room, Ichigo confronts Ywach. He takes out Zangetsu and charges Ywach, slashing him right down the middle. Ywach wakes up to a new dawn rising. It was all a dream! Or was it? Ywach remarks to himself, "What a wonderful dream. A dream so wonderful... it could have been a nightmare." He grins, ominously and toothily. Waagh! Don't you EVER do that again! Meanwhile, below, but not as below as before, Haschwalth deflects one of Uryu's arrows with his sword and notices light streaming in through one of the windows. His eyes have gone back to normal, signifying that The Almighty has returned to Ywach. 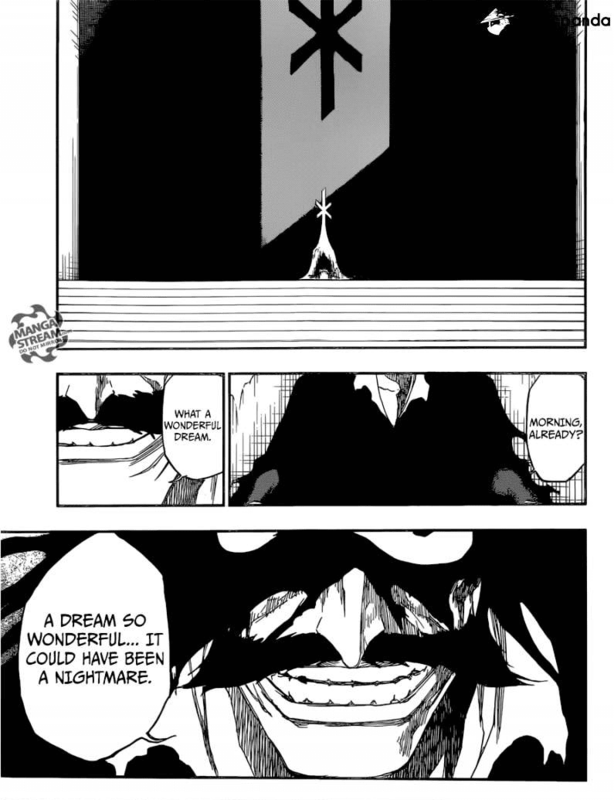 Uryu tells Haschwalth that he missed his chance to defeat him, amusing Haschwalth, who retorts "The only thing my eyes are seeing now is an animal that's not only been beaten but tamed, drenched in blood and writhing on the floor." Uryu takes that as a compliment, adding that animals aren't malicious, and Haschwalth admits that trying to use The Almighty to kill Uryu was a mistake, when his own powers are more suited to combat. He swings his sword and creates some kind of energy attack against Uryu. 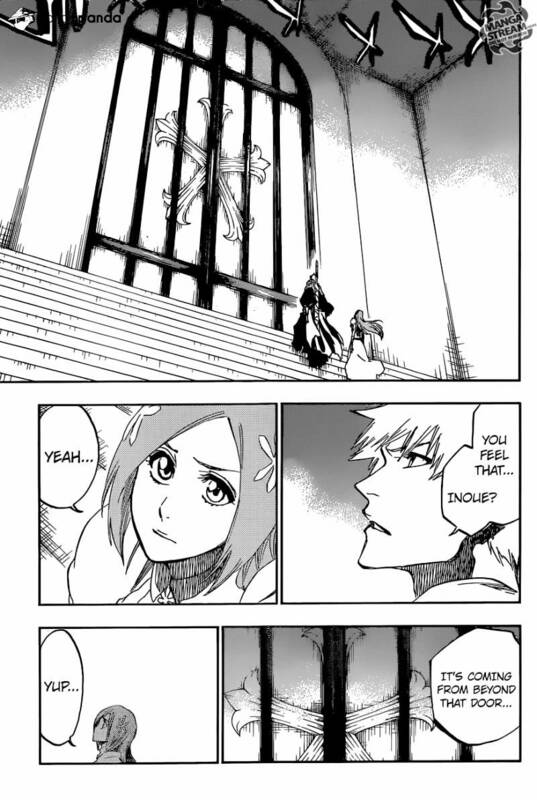 Meanwhile, above, but for realsies this time, Ichigo and Orihime finally approach the door to the throne room. Stephen Hawking does stairs better than these two. "Finally! It's almost like we've been climbing these stairs for weeks and weeks!" Ichigo tells Orihime that she's in charge of defence (by Ichigo's standards, this is a masterstroke of tactical planning) and tells her not to let him down. 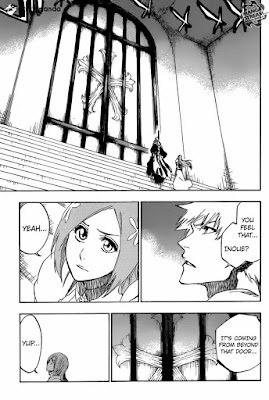 Orihime affirms that she won't, and she flashes back to Ichigo's fights, thinking to herself that she'll finally be able to fight alongside and protect him. They enter the throne room, and Ywach greets them, calling Ichigo his "Child of Darkness". "My Child of Darkness... I see you finally ditched Ganju." This was basically a set-up chapter, but it seems like the plot's back on track for the time being. This doesn't seem to have the atmosphere of a final battle, though, so I wonder where this is heading. Maybe this is just a scuffle that will lead into an Ywach flashback? 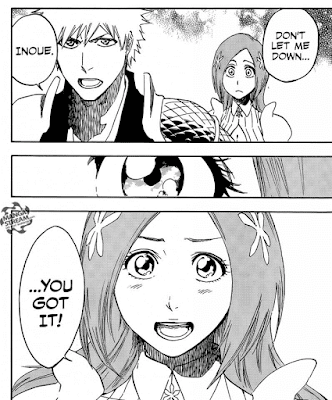 And it seems like Orihime fully intends to get involved in any fighting that happens. Until now, the main theory circulating about Orihime's role when they got to the throne room was that she'd get distracted healing Liltotto and Giselle, but it looks like she fully intends to find a place in the fight. As for Uryu and Haschwalth, I have basically no idea where that's going. If I had to guess, I'd say that Ryuuken might appear and get involved. It'd be nice to actually see their fight, though, instead of the umpteenth Schutzstaffel power-up. 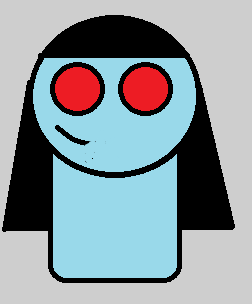 Remember plot? It's back - in pog form! Ywach ramps up the creepiness. Uryu and Haschwalth's fight is heating up. Gerard, the Bankai punching bag, regenerating yet again. I will say, though, at least his power-up forms are pretty easy on the eyes. (*cough* *Lille* *cough*). As Meliodas approaches the two Commandments, Gloxinia comments on how ironic it is that Meliodas, who once fought with them to overthrow the Demon King, is now their enemy. 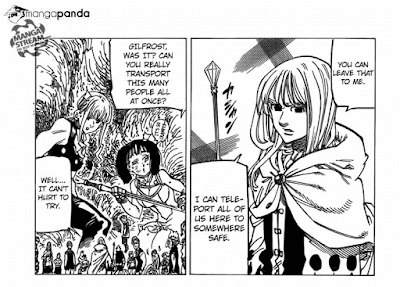 He asks if Meliodas truly intends to kill them. Meliodas confirms that he does, adding that he knows the reasons Gloxinia and Dolor have for turning "that way", presumably meaning becoming demons. He mentions the reasons, but in one of those irritatingly vague ways that glosses over all the details, serving to milk these two characters out for at least a few more chapters. Translations: "You got dumped" and "You only came second in your high school's rhymthic gymnastics competition". He launches himself at them again. Once you've gone demon, you'll never stop screamin'. Gloxinia hits him with a blast before he can get close, driving him far into the distance and exploding. From within the giant hands, Elizabeth protests that they should find a way to help him, but Ban and King disagree, thinking that they all just be handicaps who'll get in the way (as they already, theoretically, are). The tournament's resident wizardy guy, Gilfrost, pipes up and adds that he can teleport the group out of the hands so that they won't be hostages anymore. Incidentally, this scene calls into question Dolor's "genius", considering that this trap of his is roomy, comfortable, and in no way restrains his hostages, not even the giants. Speaking of the giants, Matrona angrily protests the teleportation idea, but Diana tells her that she has a plan of her own. Teleportation, perfect! What would we ever do without you, whoever you are? Gloxinia uses the respite from Meliodas to heal Dolor, and as he's finishing, Meliodas comes flying back towards them with shadowy demon wings. Gloxinia raises a treant/plant golem to slow him down, but Meliodas just punches a hole straight through it without stopping. And since Gloxinia wasn't far behind the golem, the punch also goes through him, too. ".... I got a tummy ache." Meliodas draws his sword to finish off Gloxinia, but Dolor snatches him out of the air and saves him. He earthshapes a cluster of meteorites (not the correct use of the term? Try and stop me, astrogeologists!) and hurls them up at Meliodas, forcing him to dodge them, before halting them in mid-air and making them fall back to the ground, creating a huge blast. Meanwhile, the group arrives at Leones Castle, successfully teleported. Despite the distance, they can still feel the shockwaves from the battle between Meliodas and the Commandments. Gilfrost, watching the fight through a crystal ball, curses that the Ten Commandments were freed, comparing them to an extinction event. Elizabeth asks him about Meliodas, and he responds that that's exactly why he can't keep from feeling a shiver of fear- Meliodas has won. Oh, walk it off, you big babies. A very one-sided battle, overall. Combined with the last chapter, it's basically just Meliodas pounding them down, over and over again while they ineffectually bat at him like kittens. The hostage situation was so easily resolved that it's kind of a mystery why it was even there to begin with. This whole situation seems way too easy, actually. I think the next few chapters are due for a turn-around. Dolor and Gloxinia's backstories could be interesting, as long as it doesn't get painfully drawn out. The panel of Gloxinia getting punched right in the tum-tum. 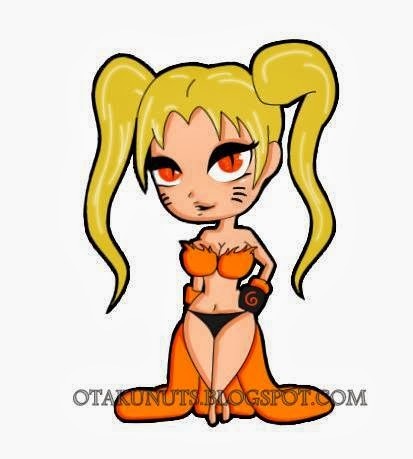 Hee-hee. The battle itself is very one-note. At character creation, Gilfrost apparently picked "deus ex machina" as his school specialisation. This chapter isn't out yet, but this entry is long enough as it is and it's been rotting in our blog tray for what feels like an eternity, so this is just going off the Jump-Netabare spoilers. If the chapter comes out at the same time as this week's Bleach, I'll do a proper review along with that. (I think this first part might just be a recap of the last chapter. Either that or the fight's stuck on repeat.) Dolor and Gloxinia finish healing themselves, and Meliodas fights them again. But it's once again a one-sided battle. At Liones Castle, Elizabeth and the others watch the fight through the crystal ball. 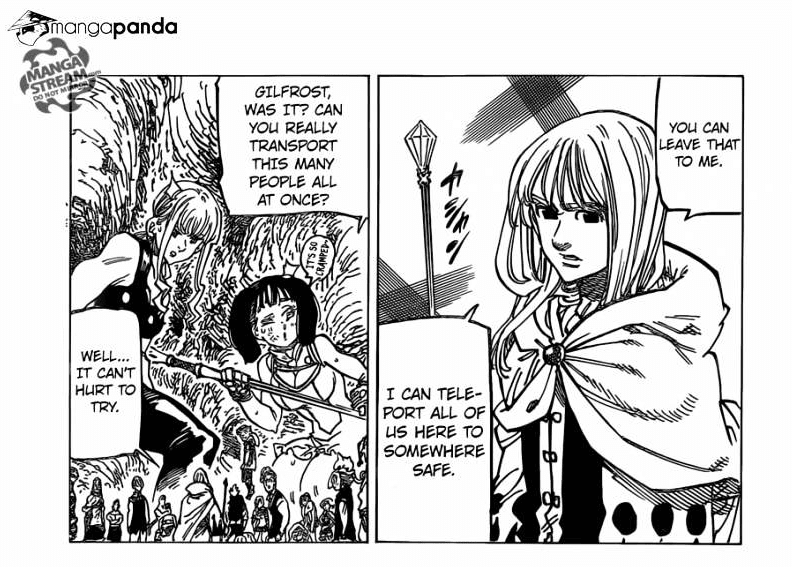 King seems doubtful, but Ban waves it off and says that they did say that Meliodas was a traitor to the Demon clan. 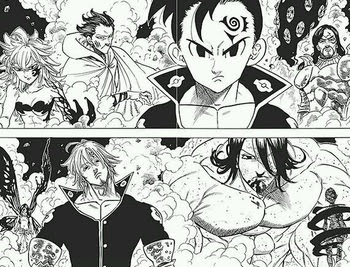 Meliodas goes to finish off Dolor and Gloxinia, but some people emitting overwhelming power arrive at the battlefield and descend to Meliodas. It's revealed that these people are the other members of the Ten Commandments, sans Galan. And yes, that's Merascylla there on the bottom-right, extra-crispy style. This is why it's very important to follow the instructions for your home tanning beds. 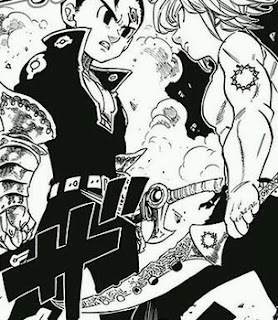 The group surrounds Meliodas, and he squares off, face-to-face, with Zeldris. This scene, in my head:"All right, Mister: you want trouble? You're going to get trouble. ""Oh, I want trouble, all right." "Then you're going to get trouble. ""No, you're going to get trouble. ""Oh, that's good, that's good, 'cuz I want trouble. ""Then we're agreed: there'll be trouble. ""Oh, yeah, lots of trouble. ""Trouble it is. ""Fer you!" "D'oh!" Pomelote is the physical embodiment of first-world millenial entitlement. You can contact her on Skype with the name suukebind or Twitter at @poorlicoricekid, if you know any good spam bots. Why, oh why won't these dancing monkeys work round the clock for her amusement?